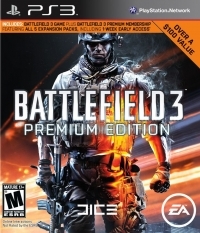 Description: With Battlefield 3 Premium membership included with this game edition, you get a digital service which includes all five themed expansion packs for Battlefield 3, including 'Back to Karkand' and 'Close Quarters,' as well as early access to 'Armored Kill,' 'Aftermath' and 'End Game.' Together these five digital expansion packs deliver a ton of new content, including 20 new maps, new weapons, more than 10 new vehicles, and four new game modes. You also get exclusive in-game items not available anywhere else, including the ACB-90 knife, a set of dog tags, and exclusive soldier and weapon camos. Plus, your membership lets you access powerful new features such as the ability to reset stats, queue priority into servers, and new decals for Platoon emblems. 06-11-2016 argyle Description With Battlefield 3 Premium membership included with this game edition, you get a digital service which includes all five themed expansion packs for Battlefield 3, including 'Back to Karkand' and 'Close Quarters,' as well as early access to 'Armored Kill,' 'Aftermath' and 'End Game.' Together these five digital expansion packs deliver a ton of new content, including 20 new maps, new weapons, more than 10 new vehicles, and four new game modes. You also get exclusive in-game items not available anywhere else, including the ACB-90 knife, a set of dog tags, and exclusive soldier and weapon camos. Plus, your membership lets you access powerful new features such as the ability to reset stats, queue priority into servers, and new decals for Platoon emblems. This is a list of VGCollect users who have Battlefield 3 - Premium Edition in their Collection. This is a list of VGCollect users who have Battlefield 3 - Premium Edition in their Sell List. This is a list of VGCollect users who have Battlefield 3 - Premium Edition in their Wish List.